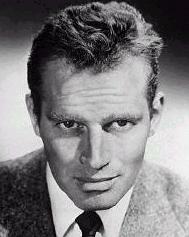 CHARLTON HESTON TRIVIA PAGE:See How Much You Know About this Great Man & Actor HERE! 1.) What is Chuck's full name? 2.) What is his wife's name? What is Chuck's nickname for her? 3.) What was the year they married & what state did they marry in? 4.) What nickname does his wife call Chuck? 5.) How many children do they have and what are their names? 6.) What was Chuck's parents names? 7.) What high school and college did he attend? 8.) How many grandchildren does he have (as of 2001) and what are their names? 9.) He made his Hollywood debut in what film? What year did he make his Hollywood debut? 10.) Who was the leading lady in this 'debut' film? 11.) What president did he play twice in two different films? What are the names of these films? 12.) What director thought he looked like Moses? 13.) Name three movies which Chuck has played the lead in which made the Top 10 Best Movies List? 14.) What movie of Chuck's made the American Film Institute Top 100 Films? What year was the movie made? 15.) How many Academy Awards has Chuck won? For what and what years? 16. What movie did Chuck portray a famous artist? When was it made? Who was his co-star? 17.) What movie did Chuck learn how to use the broard sword in? Who was the leading lady co-star in this movie? 18.) What movie did Chuck sing in during the opening credits? What song did he sing? 19.) How many times has Chuck been the President of the Screen Actor's Guild? 20.) What famous line did Chuck yell in the movie: THE PLANET OF THE APES? 21.) What is one of Chuck's favorite food---he takes this food with him everytime he goes overseas---he can not do without it and he is afraid some countries may not have it? 22.) What is his grandson's nickname for Chuck? 23.) What is the name of the film, television & digital production company, established in 1981 by Chuck and his son? 24.) He played the last man on Earth in what movie? When was it made? 25.) What illness did Chuck have recently, been treated for and is doing very well now? 26.) What famous prop did he donate to the American Film Institute? What movie was it used in? 27.) What does Chuck wear to bed? 28.) How many times has Chuck died in his movies? Can you name the movies? 29.) What are two books which Chuck has written? 30.) What is your favorite Charlton Heston film?